Deutsch: Die National- und offizielle Staatsflagge von Haiti. Die Zivilflagge findet sich hier. English: The national and official state flag of Haiti; arms obtained from http://www.webchantier.com/. The civil flag can be found at here. Esperanto: La nacia kaj oficiala sxtata flago de Haitio. La civila flago troveblas ĉi-tie. 이 저작물은 완전히 공공의 재산으로서의 정보로만 구성되어 있으며, 창작성이 있는 요소가 포함되어 있지 않아 저작권 보호에 부적격하므로 퍼블릭 도메인입니다. See also categories: SVG flags of Haiti and SVG flags - historical of Haiti. 이 기는 Other tools로 제작되었습니다. 현재 2019년 2월 18일 (월) 01:21 1,000 × 600 (21 KB) FDRMRZUSA Corrected imperfections in coat of arms. Further svg code optimization. No other changes. 2019년 2월 15일 (금) 03:37 1,000 × 600 (21 KB) FDRMRZUSA Centered coat of arms. Further svg code optimization. No other changes. 2019년 1월 11일 (금) 02:08 1,000 × 600 (22 KB) FDRMRZUSA Higher svg resolution from same file (latest version): resized by "Inkscape". Same proportion: 3:5. Optimized: reduced code. No other changes. 2018년 12월 27일 (목) 01:21 500 × 300 (43 KB) FDRMRZUSA Corrected horizontal lines in palm tree and position of palm tree. 2015년 12월 24일 (목) 14:13 500 × 300 (32 KB) Savvyjack23 Appreciate the effort Crisolympic16 but these aren't the correct combinations. 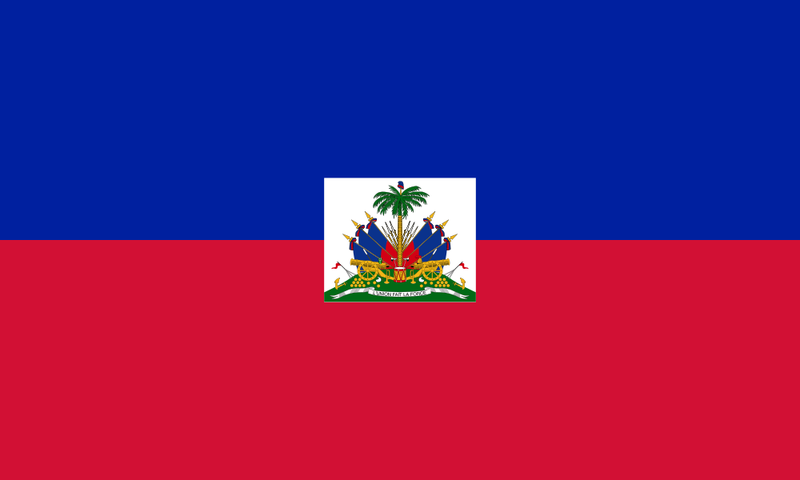 See "flown" flags of Haiti, you will not find one that resembles yours. 2015년 12월 23일 (수) 03:40 500 × 300 (146 KB) Crisolympic16 Fixed elements of the Coat of arms (Flags, Palm, Hat, Drum, Cannon, Anchors, Chains, Cannon Balls, Helmets, Guns, Trumpets, Pennants and Axes) and fixed Colour Palette.